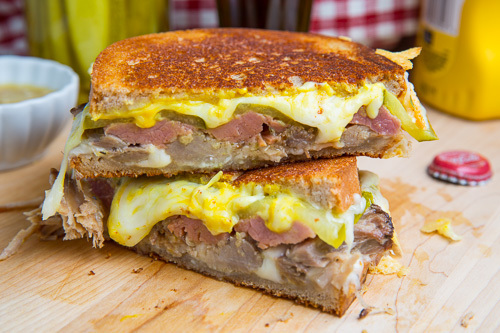 A tasty Cuban sandwich with roast pork, ham, Swiss cheese, pickles and mustard in grilled cheese form! Up next for National Grilled Cheese month is a simple grilled cheese take on the Cuban sandwich where instead of using a Cuban bun and cooking it pressed style we use bread and butter and cook it grilled style. 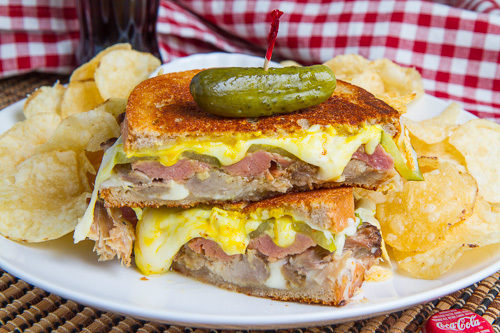 The Cuban sandwich consists of a really tasty combo of roast pork (preferably Cuban roast pork ), ham, pickle, mustard and plenty of melted swiss cheese. Although this is just a minor variation on the Cuban sandwich, it is a good one and one worthy of making an appearance National Grilled Cheese month; I mean you really can’t go wrong taking an already amazing sandwich and wrapping it in toasted buttery bread. Serve with Cuban mojo , a garlic and sour orange sauce, for your dipping pleasure. Butter one side of each slice of bread, spread the mustard on the insides, place one slice in the pan with buttered side down, top with half of the cheese, the roast pork, ham, pickle, the remaining cheese and finally the other slice of bread with buttered side up. Grill until golden brown on both sides and the cheese is melted, about 2-4 minutes per side. Option: Add a tablespoon of Cuban mojo for an extra kick! Option: Add 2 strips bacon for a pork trifecta! 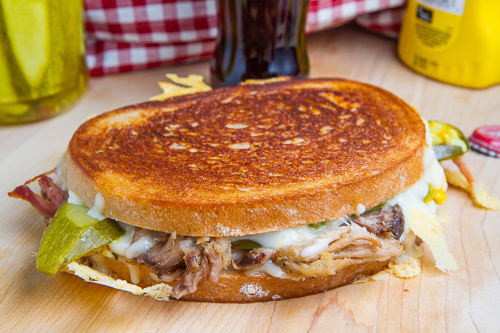 I love Cuban sandwiches, and this Grilled Cheese version looks amazing!!! All these grilled cheeses are making me crazy!! I can not decided whicj ones to make! YUM! Another great grilled cheese creation! Oh my, that is one heck of a sandwich! quite the grilled cheese master, aren't you! As the wizard of grilled cheese sandwiches, I really hope to see one of your beauties in the Grilled Cheese Academy Recipe Showdown. I mean, seriously! Cuban sandwiches are the absolute best! But who woulda thought doin' it grilled cheese style?! Must try!! I love cuban sandwiches!! This grilled cheese is perfect for those cravings! Looking like a wonderful grilled cheese sandwich! I think it is very, very safe to say that you have rapidly become the king of grilled cheese Kevin! Yum, this sure beats what I had for lunch, it looks wonderful! I had a Cuban for lunch today! Cuban sandwiches are my favorite lately… this one has me drooling. Nicely done my friend. for most of your sandwiches do you use sourdough bread? Whoa! Talk about the ultimate grilled cheese! Anonymous: A sourdough is one of my favourite breads for grilled cheese but I also like a light rye for them. my boyfriend has been craving a good Cuban for weeks, and while I hate both mustard and pickles myself, I think I'll make this for him soon!